A TEAM of officials from the Tirupati wildlife management division in Andhra Pradesh’s Chittoor districtÃ”Ã‡Ãªwas attacked by around 100 smugglers on December 15 in the Seshachalam forest. Deputy range officer N R Sridhar (49) and assistant beat officer David Karunakar (42) were killed on the spot. The team had gone in the forest to search for eight foresters who were tracking smugglers. Three other foresters were injured in the attack, while the eight whom Sridhar and his team were looking for, were hiding in the forest from the smugglers. Smuggling of Red Sandalwood or Red Sanders, an endangered tree variety, was the reason behind the attack. The tree, found only in Andhra Pradesh, is in high demand in the international market. (see ‘What is Red Sanders’). Red Sanders is an endangered species found naturally only in four districts of Andhra Pradesh (see map). The tree growth is extremely slow and takes decades to gain thickness. The deep red-coloured wood is sturdy and does not lose shape even in harsh temperatures and humidity. It is easy to carve and a tonne of the wood fetches between Rs 20 lakh to Rs 40 lakh in the international market. Red Sanders is in huge demand in countries like China and Japan, where it is used in making musical instruments, sculpture, furniture and medicines. Unconfirmed reports say it is also used as a coolant in nuclear reactors in China. As per the estimates of Andhra Pradesh forest department, 3,000 tonnes of Red Sanders is illegally removed from its forests every year. Red Sanders smuggling has been going on for a long time, but has increased substantially in the past few years, says G Sreenivasulu, Divisional Forest Officer of Tirupati Wildlife Management Division. Around 1,000 tonnes of Red Sanders is seized every year in the country. At present, about 11,800 tonnes of seized Red Sanders logs are lying with various states. Andhra Pradesh has the maximum stock of 8,500 tonnes of the unfinished wood, seized since 2002. For several years the state has been lobbying with the Centre to allow it to export the seized wood. It claims one-time export of the seized wood will satiate the demand of international market and bring down the illegal trade. Yielding to Andhra Pradesh’s demand, the Union Ministry of Commerce, in October 2013, allowedÃ”Ã‡Ãªit to export the seized stock.Ã”Ã‡ÃªAndhra Pradesh has to export the wood by April 2014 and is likely to earn about Rs 1,000 crore. The ministry has also allowed the Directorate of Revenue Intelligence, the Central body responsible to check smuggling at the borders, to export 1,200 tonnes of the unfinished wood. Exporting Red Sanders requires permission from the Convention on International Trade in Endangered Species of wild fauna and flora (CITES), a binding treaty between 179 countries to control trade of exotic wildlife species. India is a signatory to CITES. CITES had banned the export of Red Sanders from India in June 2010 citing irregularities in certification of products being exported and India’s failure to conductÃ”Ã‡ÃªNon-Detriment Finding (NDF), a study to establish conservation status of the species and the impact of trade on it. Recommendation to carry out NDF was made by CITES in 2007. After CITES imposed the ban, the Ministry of Environment and Forests (MoEF) started making efforts to get it lifted. It got the Institute of Forest Genetics and Tree Breeding in Coimbatore to prepare NDFÃ”Ã‡Ãªwhich was sent to CITES in April 2012. The report said natural Red Sanders forests were inÃ”Ã‡Ãªpoor shape and recommended a ban on felling the tree in the wild. However, it did not say anything about the wood seized in government crackdowns. It was also silent onÃ”Ã‡Ãªthe sale of wood from private plantations. MoEF submitted NDF to CITES in April 2012 and asked for a one-time permission to export of the seized wood.Ã”Ã‡ÃªThe ministry also asked CITES to allow export of 310 tonnes of Red Sanders every year from private plantations in Andhra Pradesh and Tamil Nadu. CITES agreed to both the demands. To allow the export of unfinished Red Sanders wood, the Centre has made several exceptionsÃ”Ã‡Ãªin the policies that were formulated to conserve the rare wood variety.Ã”Ã‡ÃªBeing endangered, Red Sanders was included in the negative list of exports in 1998 by the Cental government and as per India’s Foreign Trade Policy, no export of unfinished Red Sanders wood is allowed. The ban applies to wood found in the wild as well as that grown in private plantations. But export of products made from the wood is allowed to promote Indian handicrafts. In July 2013, MoEF withdrew its September 2011 order that restricted states from selling seized Red Sanders to private parties. The order made it mandatory that seized stock should be allocated to local artisans through Andhra Pradesh Handicraft Development Corporation. “The handicraft corporation could only buy a miniscule quantity as they do not need it in such a large volume. Besides, this did not leave the states with any incentive toÃ”Ã‡Ãªcheck illegal trade,” said an MoEF official. The Andhra Pradesh government has been arguing thatÃ”Ã‡Ãªexport will reduce illegal trade. The forest department says that the demand of Red Sanders in the international market is around 3,000 tonnes per year. It also says that the ban on export is making the seized stock lose value as there is not enough domestic market.Ã”Ã‡ÃªBut similar exceptions were made in 2006 and 2008 when Andhra was allowed a one-time disposal of seized stock. Around 1,000 tonnes of logs were exported but that did not curb illegal trade or felling of the tree in Andhra Pradesh. Andhra Pradesh’s efforts to check smuggling have borne little success. Just six months ago the state government has constituted a special task force (STF) which includes officers from the police and the forest department. In last six months,Ã”Ã‡ÃªSTF has arrested 511 people and seized 54 tonnes of Red Sanders, says STF chief G Uday Kumar.Ã”Ã‡ÃªMore than 3,500 people have been arrested in over 4,500 cases in last 10 years. 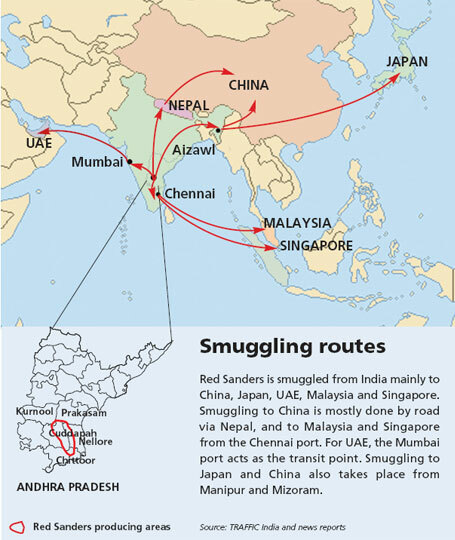 “Most of the jails in the Rayalaseema region have a high number of RedÃ”Ã‡ÃªSanders smugglers. 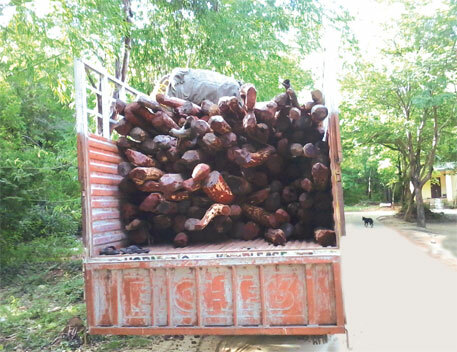 But it seems arrests are not a deterrent as smuggling Red Sanders offers high returns without any investment,” says an Andhra PradeshÃ”Ã‡Ãªforest officials. Jagdish Kishwan, former Additional Director General of Forests (Wildlife) who represented India when it was lobbying with CITES, defends the ministry’s stand but recommends that robust checks and balancesÃ”Ã‡Ãªshould be put in place before India starts exporting any Red Sanders wood. Hello! I ask what time the red sandalwood auction? Regular auction finished timber can then export it? How dumb Indian officials are. Rather than ban an export oriented industry, the government should actively encourage the growth of redsanders in private plantations for export so that it meet the ever growing Chinese demand and help earn valuable foreign exchange for arid regions like Rayalseems. With modern plant genetic science, it is easy to determine the DNA of plantation timber vs old growth forests. However, proper vigilance and law enforcement will help to beat the smugglers. Alas, I am just dreaming! can you please share your contact details.